The current Infiniti QX60 is the former JX35. Infiniti has changed its model naming convention by assigning a “Q” or a “QX” to precede the two-digit name for every vehicle that it sells. The “Q” precedes every car model, the “QX” designation is for its utility vehicles. Thus, a 2013 G Coupe is now a 2014 Q60 and a 2013 JX35 is now a 2014 QX60. Well, apparently Infiniti customers do or at least they do not care: through April 2014, year-to-date brand sales are up 14.7 percent, double the pace of the market. Leading the sales charge is an all-new model that was not around previously, the Q50 sedan. It replaced the previous generation G sedan which is, by the way, still on sale for at least another year. Confusion aside, I had to break out my Infiniti nomenclature chart to remind myself that the 2014 Infiniti QX60 that recently appeared in my driveway was last year’s JX35, a model that I tested in Sept. 2013. The current model offers few changes over the previous edition other than splitting its Premium package into two parts: Premium and Premium Plus, and adding power folding seat third-row seats to the available Deluxe Touring Package. A new hybrid model also joined the line up this year. Everything else about the model was the same right down to the pretty Midnight Garnet exterior and Java interior color scheme. Still, I was happy to get this crossover back for a test drive no matter the similarities beyond its name. 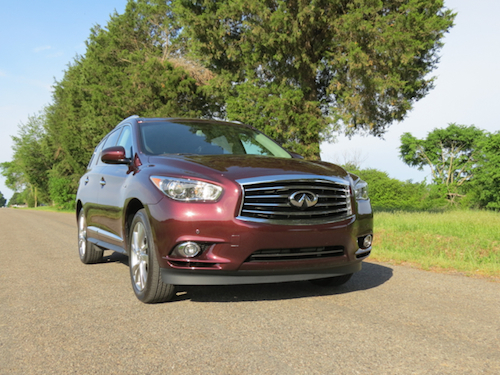 The 2014 Infiniti QX60 is sold in front- and all-wheel-drive versions. The price difference between models is small ($42,100 versus $43,500) and the gas mileage difference is just 1 mpg. I do not have the breakdown on model take rate, but I would venture to say that the overwhelming number of models sold skew to the AWD. And why not? It comes in handy when faced with slippery conditions and it provides better towing too (5,000 pounds to 3,500 pounds) than the FWD edition. On the road, this crossover performs well, its 3.5-liter 24-valve V-6 engine making 265 horsepower and 248 foot-pounds of torque. It is paired with a continuously variable transmission and I must say that the pairing is a good one. Some naysayers hate CVTs and there is nothing that I can say that would convince them otherwise. Not all Nissan CVTs are as good as the QX60’s, what responded smoothly to the many demands put on it. That included much highway drive time where hard acceleration was needed and no delay in response was felt. It does the job that owners would expect and that includes delivering ample power while still returning decent highway mileage (19 mpg in the city and 25 mpg on the highway). Handling and steering is as you would expect with a luxury crossover — not eventful, but with no drama either. People do not buy these vehicles for a sporty ride, but they do insist on comfort, quiet and no drama. Give the Infiniti QX60 high marks in all three areas. Inside, the cabin is roomy and bright, providing seating for seven. The last row seems almost like an afterthought as it is not especially comfortable for adults except in a pinch. For families with small children, it will certainly do — Infiniti makes up for it by providing four cup holders “back there” or 14 drink holders total. Every Infiniti QX60 comes equipped with leather-appointed seats. A driver’s 8-way power and front passenger 6-way power seats are standard. Standard rear seating includes a 60-40 split bench second-row seat and a 50-50 split third-row seat. The seats are comfortable, bolstered and supportive. Driver controls are sensible too with the transmission stick located fore of the deep and compartmentalized center console with important secondary controls seated on the leather-wrapped steering wheel. The instrument panel features a pair of analog displays (tachometer and speedometer), what flank the driver’s digital information center. Infiniti provides one trim level and adds packages to that. The base sticker price quickly climbs as many of the amenities and other goodies typically found in press fleet vehicles are included. These extras were: roof rails ($490), technology package ($2,800), a theater package ($1,700), deluxe touring package ($3,450), illuminated kick plates ($305), premium package ($1,550) and a premium plus package ($3,000). That’s nearly $15,000 of upgrades, bringing the test vehicle’s sticker price to $57,240 including a destination charge. All models are outfitted with keyless entry and push-button start, a tri-zone climate control system, rear seat heater ducts, a power sliding tinted moonroof, a power tilt and telescoping steering wheel column, power folding and heated side mirrors, a power liftgate, a seven-inch color display with a rear monitor, Bluetooth connectivity, SiriusXM satellite radio, auxiliary input jacks, and a six-speaker audio system with an MP3 player. With so many extras to choose from I found it hard to imagine driving or let alone owning the Infiniti QX60 without the included amenities. I might have scrubbed the technology package, what includes backup collision intervention, blind spot warning and forward collision warning. Then again, I have warmed up to its semi-autonomous driving features where activate brake assist stops the crossover if you do not. And, the intelligent cruise control always maintains a safe distance between you and the vehicle directly in front of you. Infiniti does not allow you to shop cafeteria style for technologies — everything is sold under the various packages. The theater package adds a pair of 7-inch color monitors to the rear of the front seat headrests. You get wireless headphones with a remote and an upgraded rear console that adds a 120-volt outlet, input jacks and headphone jacks. Personally, I am glad when an outlet is included, what allows me to recharge my laptop when on the go. The deluxe touring package is what adds beauty to this already attractive model. You get 20-inch aluminum alloy wheels, climate controlled front seats, heated rear outboard seats, maple interior accents and perhaps the best feature of all: a panoramic moonroof with sunshade that spans the second and third rows. When open, you get a generous amount of light, what makes the cabin seem airier and more spacious. This package also brings in a Bose audio system. Choose the premium package and your Infiniti QX60 is upgraded to a 13-speaker Bose audio system. A heated steering wheel, driver lumbar support and remote engine start are among its features. The last package, premium plus, brings in the navigation system with Infiniti Connection infotainment, what makes voice recognition possible and includes traffic and weather reports. A family favorite was the around view monitor that split the now 8-inch screen to show an overhead view of the vehicle as well as of the rear view. Moving object detection is included, what alerts the driver visually and audibly to someone or something near the vehicle. Front and back sensors work in tandem with the front and rear cameras to pick up the action. With the deluxe touring package included, the third-row seats fold one by one. A button on each side of the storage compartment must be pressed and held to complete the process. Hooks, tie downs and a 12-volt outlet are also found in the rear compartment. Underneath is another storage compartment what also stored the Bose sound system in this model. Push the button on the liftgate door and it closes. Manufacturers are building more utility vehicles because customers want them. With four models to choose from, Infiniti has the market well covered. Among competing models, you will find the Mercedes-Benz GL-Class, Acura MDX, BMW X5 and the Land Rover LR3. Bulkier competitors include the Cadillac Escalade and Lincoln Navigator, but these models are typically cross shopped when the Infiniti QX80 comes into play. You might also consider the Infiniti QX70, a sportier model that offers standard rear-wheel drive, optional all-wheel drive, but seats just five. Finally, the hybrid version may also be worth a look, one that retails from $45,100 and delivers 28 mpg on the highway. 2014 Audi A6 TDI Quattro: Diesel Does It! 2014 Infiniti QX60 AWD photos copyright Auto Trends Magazine. All rights reserved.